Schoolgirl Abbie Mclaren died after being hit by a car in Motherwell on Tuesday. Thousands of people have signed a petition calling for traffic calming measures following the death of a 12-year-old girl who was hit by a car in North Lanarkshire. The collision happened on The Loaning in Motherwell, at around 4.15pm on Tuesday. 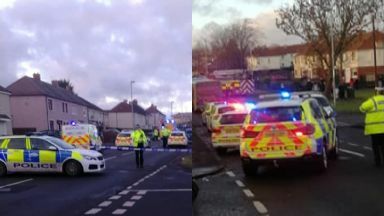 Emergency services were called to the scene and the girl, named locally as Abbie Mclaren, was taken to Glasgow's Royal Hospital for Children but later died. Police said a 38-year-old man has been arrested and is due to appear at Hamilton Sheriff Court on Thursday. Members of the community have launched a petition calling on North Lanarkshire Council to introduce traffic control measures on the road. It states: "I can't imagine the pain and suffering the family are going through at this tough time and I think we all would not want it to happen to anyone again. "So even the simplest pedestrian crossing, priority system or even speed camera just to let children cross safely or at least slow traffic down could make it a lot safer for our children, grandchildren and even elderly." Emergency services on the scene following the incident. More than 8700 people have signed the petition so far. Motherwell & Wishaw MP Marion Fellows has also raised concerns about the situation and said she has written to North Lanarkshire Council to highlight the petition. She tweeted: "My deepest condolences to the family and friends of Abbie who has sadly lost her life. My thanks go to the emergency services who attended and did their utmost to treat her. "The community is rightly heartbroken over what has happened. 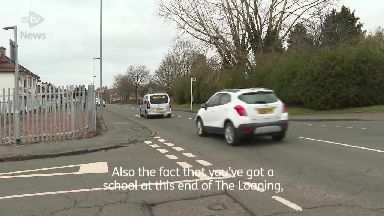 "I have since written to North Lanarkshire Council to raise the community's petition with them and to join their calls in demanding action to improve safety on The Loaning and surrounding streets. "I have particular concerns over speeding cars and safe crossings." North Lanarkshire Council said it will work with police during the investigation. A spokesman said: "Following a tragedy such as this, it is understandable that people will raise concerns about road safety. "The council's immediate focus is on supporting pupils, staff and the wider community who are deeply affected by this appalling tragedy and the condolences from everyone at the council are with Abbie's family and friends. "We will work with Police Scotland throughout their investigation into the circumstances and will take appropriate action based on their findings. "Against that backdrop and in light of ongoing criminal proceedings, it is entirely inappropriate to speculate on the causes and circumstances of Abbie's death." A cousin of the schoolgirl has set up a GoFundMe page in her memory, which has raised more than £2700.